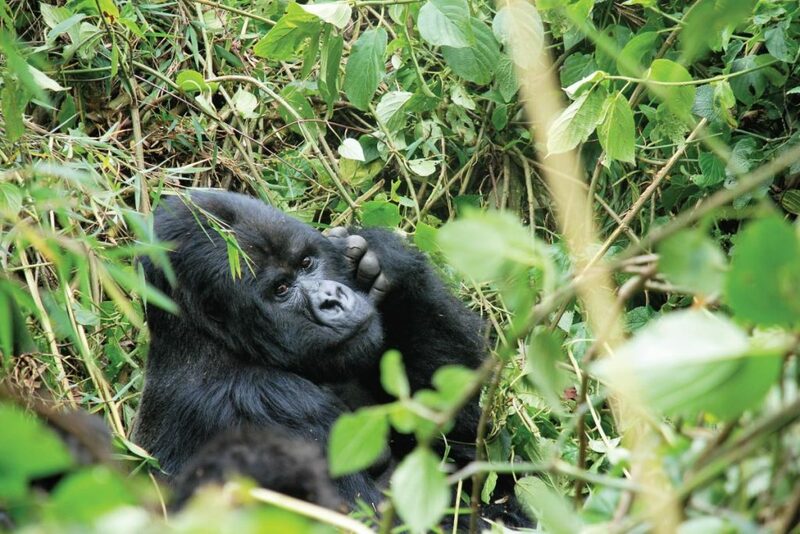 This 10 day Uganda Rwanda tour gives you the chance to track Gorillas and Chimpanzees in two countries. 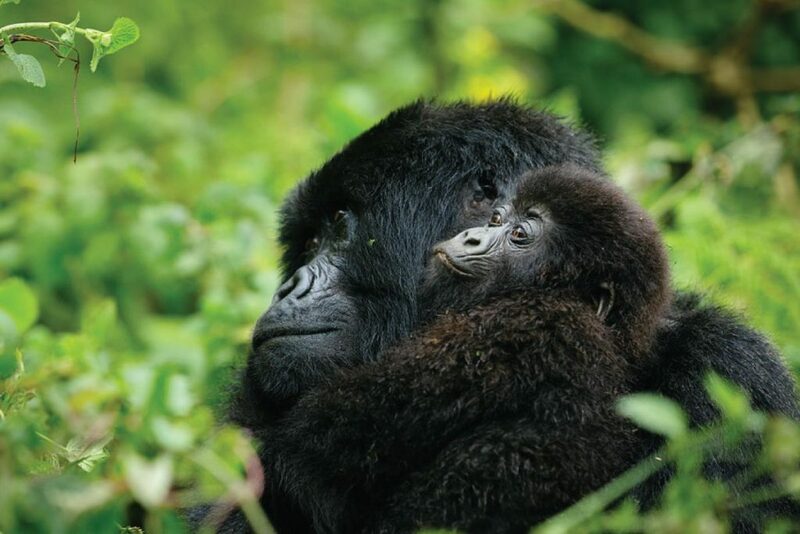 Bwindi impenetrable Forest National Park in Uganda and Volcanoes National Park in Rwanda are the famous habitats of mountain gorillas and the only two locations you can track them on earth. There are different gorilla families available for tracking in both parks and Uganda has 12 groups/families while Rwanda has 8 of them. After breakfast our driver/guide picks you up to transfer to Fort portal/Kibale National Park with lunch en-route. In the evening visit the guided scenic walk to the crater Lakes of Ndali and to the “top of the World” as you start your Uganda, Rwanda tour. After breakfast, head to the park headquarters for briefing about the park and the rules that guide chimpanzees trekkers in the forest. After the brief we enter Kibale tropical rain forest accompanied by a ranger, in Search of chimpanzees and other primates like the black and white Colobus, vervet monkeys,grey cheeked mangabey and olive baboons among others. The time spent searching depends on how far they have gone in their food search, but on encountering them only an hour is allowed around them for conservation reasons. Use the allowed time to watch them play, feed and groom each other and take some great pictures too. Return to the lodge for lunch and in the evening go for a nature walk in Bigodi Sanctuary a wide wetland area that has become a nature trail, an initiative of the local community for income generation and conservation. 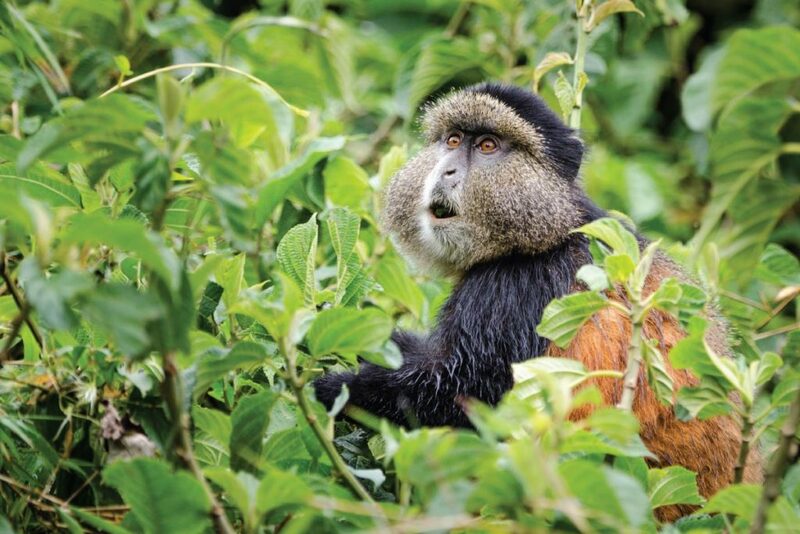 Bigodi is a sanctuary for several birds and primates moreover it offers great chances of sighting the rare shoe bill, sitatungas, plus more with the help of a local guide. 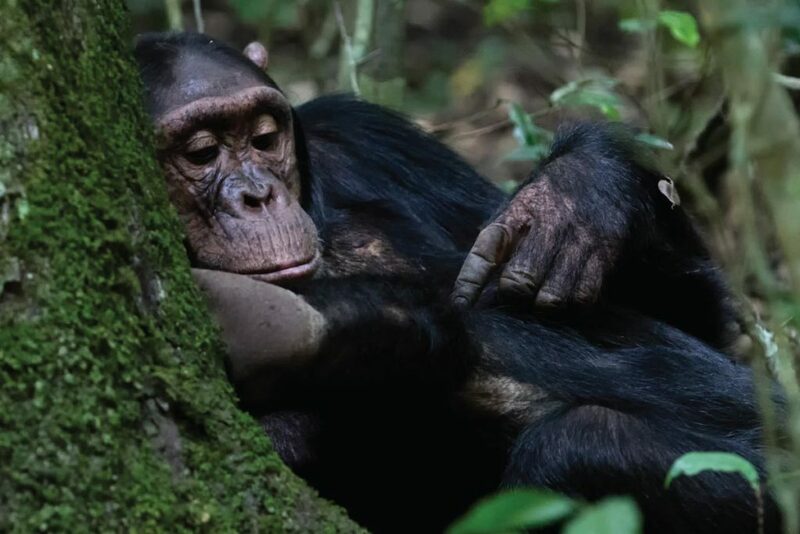 Have a relaxed breakfast and thereafter embark on the drive to Bwindi National park via Queen Elizabeth National Park for an opportunity to spot game as you drive through with chances of spotting Elephants, Uganda Kobs, Lions and countless beautiful bird species. Have lunch along the way to arrive in the evening and check in at your overnight lodge. Today is dedicated to the Gorilla tracking experience which begins at 8:00 am with a briefing from the Uganda Wildlife Authority rangers.Items to bring along for a great gorilla tracking experience include: a rain jacket, sunscreen, insect repellent, a hat, drinking water, snacks, comfortable hiking boots and of course a well charged camera among others. The guides will lead you inside the forest to encounter the gentle giants group/family you have been booked to visit. Please remember to bring your lunch boxes and necessary gear for an enhanced gorilla tracking experience. Tracking the rare Mountain Gorilla is perhaps one of the most exciting wildlife experiences on earth. 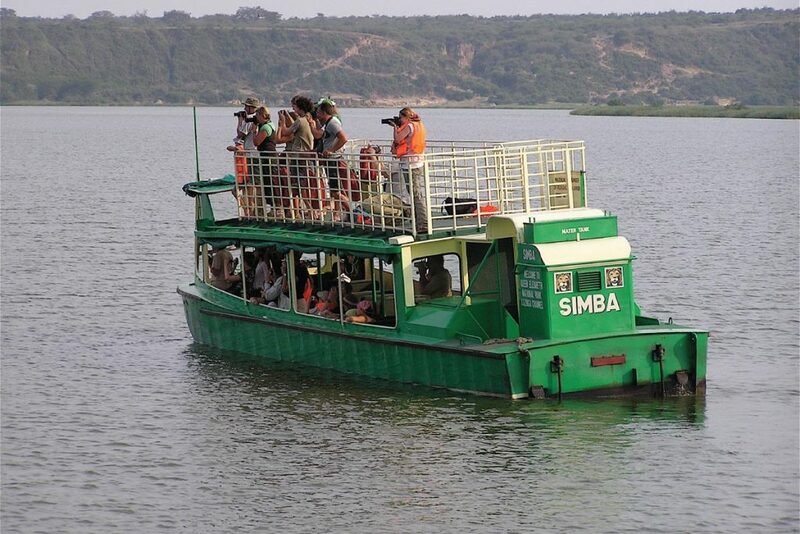 Gorilla tracking may last between 2 to 8 hours but its worth all the effort put in to see them. If time allows, on return from the jungle you may go for a village Walk/ Community visit for a great opportunity to see how the local people live. Meeting the human natives of Bwindi is a delightful moment indeed. After breakfast, embark on a scenic drive enjoying the undulating land forms of Uganda all the way to cross into Rwanda. Have lunch at our overnight accommodation and spend the evening enjoying views of the beautiful hills endowed to Rwanda, within the comfort of your lodge. Have breakfast and head to the park headquarters for briefing about the rules of the park and how to behave around the mountain gorillas in their misty home. After the brief head out to search for the gorillas, and enjoy the 1 hour allowed time with them to take unforgettable photographs as you watch them play,feed and groom each other. For a great tracking experience on this Uganda Rwanda tour, bring rain gear,comfortable walking/hiking shoes, insect repellent, sun screen, a hat, packed lunch and bottled mineral water. After breakfast proceed on another scenic drive along the amazing undulating hills that make Rwanda “the land of a thousand hills” heading to Lake Kivu with lunch en-route and end the journey with a beautiful white sand bathing on arrival. Have breakfast and thereafter go on a boat cruise on Lake Kivu to different fishing villages with chances of spotting a variety of birds. Watch the local fish mongers as they go about their daily duties and take memorable pictures as you enjoy a serene boat ride. Return to the lodge for lunch and thereafter drive to Nyungwe forest for the night. Dinner and overnight at Nyungwe Forest Lodge (High end lodge) or Nyungwe Hill Hotel (Moderate facility) or Gisakura Guest House (Budget facility). Head to the park headquarters for briefing about the forest and its chimpanzees before getting into the jungle to search for the primates. Besides chimpanzees the search provides good chances of seeing other primates like the black & white colubus, velvet and grey cheeked mangabey monkeys. Several bird species and butterflies are also found here. Later in the day go for a canopy walk, a unique and a refreshing experience on your Rwanda tour, providing good opportunities to see the primates at a much closer range. After a relaxed breakfast and full of life memories of your Uganda and Rwanda tour, head to Kigali with a lunch stop en-route. Visit some of the cultural markets along the way, for curios to take home as souvenirs from “the land of a thousand hills”. Continue to Kigali International Airport for your return flight home.